The 743 restoration project is nearly complete! Viewed from the outside, only the lettering is yet to be added; the complete body paintwork, and accessory add-ons are complete! 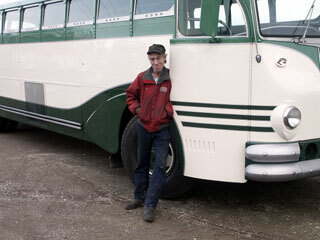 After months of body preparation work by Ted Campbell, owner of Coach Maintenance, Inc., and Dave Pagel, the two committed themselves to set aside everything else, and paint this coach full time, until it was completed. They started on a Monday. After five very long days, it was pronounced complete, the following Saturday morning. Three major colors were applied, plus striping. Two gallons of light green, 4 gallons of dark green, and 3 gallons of white paint were used to create the unique California Parlor Car Tours style on this coach. (Original photos of this same coach when used by California Parlor Car tours in San Francisco, are available elsewhere on the Internet.) Silver striping paint was used to add the finishing touches to this excellent work. To continue to the latest 2004 photos, please click here !